Stacey Mata NASM-CPT, CES on enhancing your quality of life through LOVE, SWEAT and CHEERS! Enthusiastically translating all that confusing health and fitness jargon on the web while motivating you to succeed and reach your goals in a healthy and safe environment! Self Myofascial Release (SMR) is a self-stretching technique that has becoming increasing popular within the fitness industry. SMR is usually performed with foam rollers, but are not limited to just the rollers themselves. Other assistive devices such as tennis balls, lacrosse balls, medicine balls, PVC piping, and SMR massage sticks are all great investment tools that are an inexpensive realistic alternative to massage therapy sessions (1). Self Myofascial Release is based on the principal of dysfunctional movements of the neural and fascial systems of the body. Dysfunctional movements can be caused by incorrect posture, incorrect movement patterns or repetitive movements/motions of the body. When the body goes through these types of incorrect motions or movements, your body will interpret these movements as injuries occurring in your body. This causes what is known as The Cumulative Injury Cycle (1,2). As your body recognizes this “injury,” it will try and repair itself. This process tries to repair the damages that these faulty movements patterns cause within the fascia. 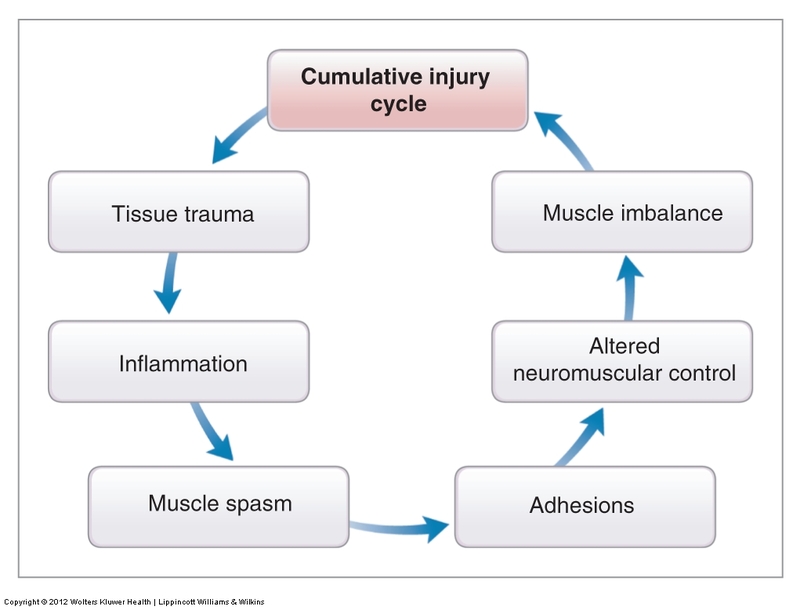 This cycle follows a path of muscle tissue/fascia inflammation. This muscle inflammation activates that body’s pain receptors as a protective mechanism and increases the muscles tension which causes a muscle spasm. Muscle (micro) spasms increase the development of soft tissue adhesions that can lead to altered neuromuscular control and muscle imbalance, and relative flexibility (1-2). The adhesions reduce the elasticity of the soft tissues and can eventually cause a permanent change in the soft tissue structure, (Davis’s Law). Davis’s Law states that muscle will model along the lines of stress (1,2). SMR focuses on alleviating these adhesions (also known as “trigger points” or “knots”) to restore optimal muscle motion and function (1). According to the National Academy of Sports Medicine, SMR (with foam rolling) benefits include: the correction of muscle imbalances, muscle relaxation, improved joint range of motion, improved neuromuscular efficiency, reduced soreness along with improved tissue recovery, the suppression/reduction of trigger point sensitivity and pain, decreased neuromuscular hyper tonicity, provides optimal length-tension relationships and the decrease the overall effects of stress on the human movement system. Clark MA, Lucett SL. NASM Essentials of Corrective Exercise Training, Baltimore, MD: Lippincott Williams & Wilkins; 2011. Clark MA, Lucett SL. NASM Essentials of Personal Fitness Training 4th ed. Baltimore, MD: Lippincott Williams & Wilkins; 2012. Penney, Stacey. http://blog.nasm.org/training-benefits/foam-rolling-applying-the-technique-of-self-myofascial-release/ 21 August 2013.